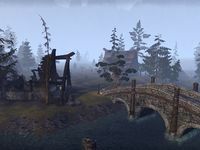 Darkwater Crossing is a small Argonian settlement east of Fort Amol in southern Eastmarch. Darkwater Crossing also appeared in Skyrim. Darkwater is one of the locations required for the Striking Locales achievement in Eastmarch, but does not use the map icon which symbolizes this ( ).